New shot taken today, same stick probably the same bird knowing how territorial they are. Got lucky this time around, bonus frog in beak! Full frame image, shot taken from a vehicle 'hide', range to subject about 12-15 feet. 300mm @ f8 1/200 shutter priority -0.7EV ISO-200. Wow! What a picture. The bird is perfectly in focus with fantastic DOF. The background is also very nicely blurred. WOW, stunning !!! This is an excellent shot Ken, the colours are gorgeous, the detail is great and the pose and composition too. Can't find any nit here. You captured a wonderful moment. Wow, again this wonderful kingfisher, today with a big frog-bonus! I like to see one of this birds one time in my life in nature, it must be an exciting experience. Just one word, Ken. Stunning! extra ,superbes couleurs,tres bonne nettet�. je lui souhaite bon apetit. This is an excellent capture. Excellent colours, great sharp details, great lighting and POV. Composition and DoF are excellent also. Very well done. Thanks for sharing. This is an excellent capture, great details and very good pose with great composition, very well done!!! AWESOME SHOT, THIS IS JUST SO WORTH LOOKING AT AND WELL WORTH WAITING FOR I GUESS. very sharp,did you do any sharpening in software or is that out of the camera ?. Great Sharp , DOF , colors , timing !!! Nothing much to say about the picture. It's just perfect! Tout est parfaits,les couleurs,la netett�,l'action,la pose de l'oiseau et l'�clairage. Very clear image this wonderful bird. The colors are impressive. Very good job. Absolutely fantastic photograph!!! Now you must go out and photograph another species! ;) Stunning picture- one of the best I've ever seen. Fantastic capture Ken! Colors are outstanding. DOF and POV are excellent. Razorsharp details and beautiful light. SUPERB! Excelente fotografia. Que colores tan hermosos, una escena muy interesante y un punto de vista muy completo. Gran trabajo. Stunning shot. 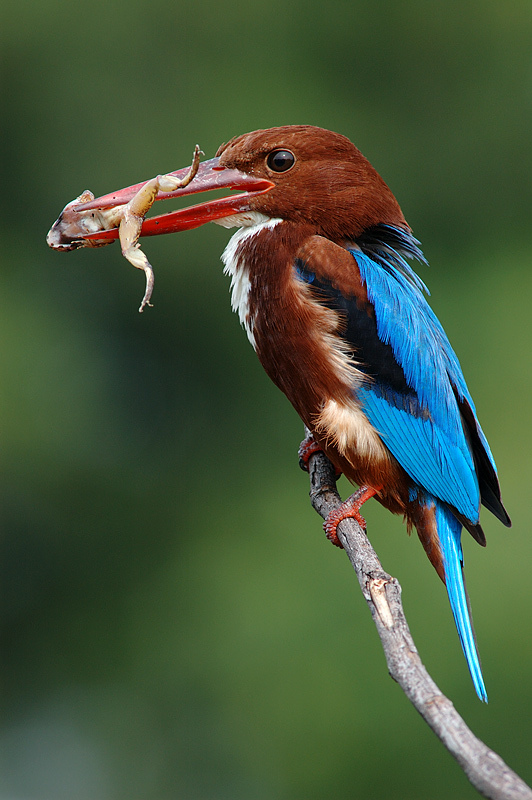 Colours are so rich and the meal in the beak is awesome. Perfect! Thanks. Mind blowing quality, flawless and absolutely perfect, top stock photography quality. Very sharp and detailed, beautiful colours. I think you are the king Ken! Beautiful work. Did you hand hold this? Like the simple composition and background without distractions. Thanks for sharing! Poor frog. Amazing shot, outstanding colors. Framing is good, composition excellent. Bravo! Super photo. Straight into favourites. I just say only one thing. It's perfect. Superb, flawless picture of bird and prey. Sharp in every aspect. Very well set off from the background. A rare masterpiece of nature photography. Congratulations! Sorry, I have no time today to write complete comments. Very well done. Well deserved icon. It can't be better! With the bite in his beak! Wonderfull,... clear photo, great colours, detail is perfect and contrast to the background can not be better. Very nice shot! Beautiful colours and subject! Terrific shot. Very sharp and satured colors.The combination of colors -also the background - is magic. Wow, wonderful photo. What luck to catch him eating! Great colours!